Today we left Belize behind getting up around 6 am in order to have breakfast and be on the road by 6.40 am. Border control was interesting, we paid $18.75 USD To exit Belize and about $1.25 USD to enter Guatemala. The interesting aspect is we walked past border control and Andrea then went back with our passports to pay the entry costs and get our passports stamped. We easily could have entered the country without getting checked. I’m guessing they aren’t really worried about terrorists or illegal immigration! 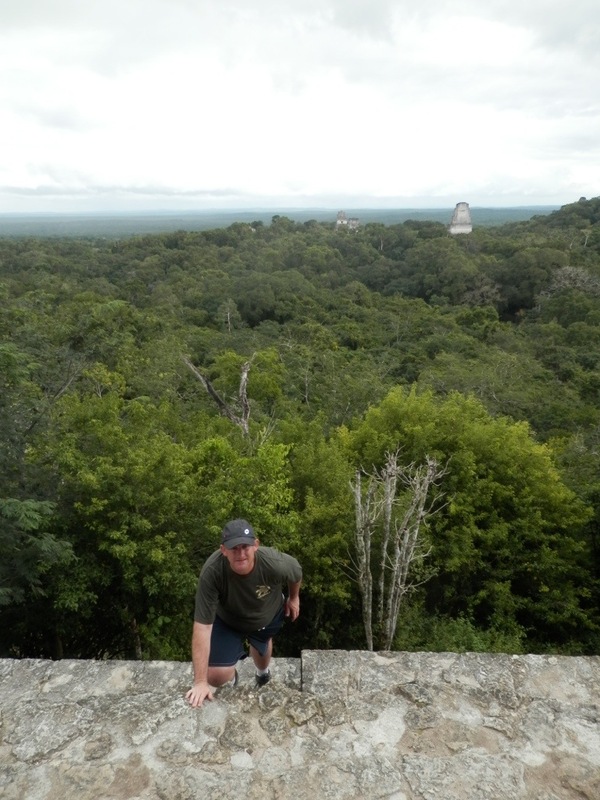 We then took our private van to the Tikal National Park to visit the Tikal Ruins. This former Mayan city dates back to the 4th century BC and was in use until about the 10th century. The population might have gotten as high as 90,000 people. Our guide took as around the site for close to 3 hours and we got lucky in that it only rained very lightly at the end of the time here. The most impressive site was the 4th Temple that is over 60 metres high. Climbing up this temple I looked out at the surrounding areas full over grand trees and other Temples, some taken back by the forest. The view from here was used in the Return of the Jedi movie for Endor. It really felt incredibly grand. The Mayan civilisation could be extremely vicious in victory. Rulers of defeated cities would be sacrificed or castrated in public and the event then painted or carved in stone. You did not want to be on the losing side that is for sure. The residential area of Tikal covers an estimated 60 square kilometres and only 20% has been excavated and the forest hides a lot of the structures very well, in fact I could only tell once some sites were pointed out. The Plaza of the Seven Temples has been restored and gives you a sense of just how grand this place was at its height. In this area they also played games. After leaving this ancient site we drove to our night stop at Flores. Andrea took us to a street vendor to buy three tortillas for only $5 Guatemalan which is around 60 cents. For dinner I ordered the local speciality a fish caught in the local lake that is a predator. Very tasty predator :). A necessary clothes drop for laundry which I hope comes back tomorrow. During the day I bought some shorts to replace the two that have been wrecked over the past month. Hopefully I won’t need to buy anything more until I return home.